The coaxial RG-6 type cable DAXX A30 has been designed for application in sphere of Cable TV, Satellite TV, CCTV, Security/Surveillance cameras connection. We offer this high-quality cable that ensures less signal loss over long distances than other cables. 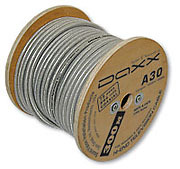 DAXX A30 features a RG6 coaxial construction with double shield protection made of 95% copper braid + 100% aluminum foil and tinned copper central conductor. The large central solid-core 18 gauge oxygen-free copper conductor of the cable is surrounded by a low-loss polyethylene foam dielectric to provide very low capacitance and the exacting impedance characteristics needed for maximize bandwidth and accurate signal transfer.The 7.0 mm PVC outer transparent jacket provides both flexibility and mechanical protection for tha cable. Tested at 2.2GHz. ISO9001:2008; GB/T 19001-2008.